A look at artwork through the centuries shows that attire for the clergy has changed greatly over the two millennia of the Church. However, the color purple is of ancient origin and has traditionally been used mostly by royalty since it was among the most difficult of colors to produce, and hence expensive and affordable only to royalty. Within the Church, an overlay of theological or spiritual meaning is often added to practices or customs centuries after those customs arise out of convenience or common usage. For instance, it is almost certain that the use of purple attire by bishops was originally intended to show that the bishops possessed religious and spiritual authority equal to the temporal and civil authority of princes and kings. Pious commentators later came to suggest that bishops wore purple in imitation of the purple cloak placed on the shoulders of Jesus during his trial on Good Friday. The Gospel of Matthew states that the soldiers placed a scarlet robe on Jesus (see 27:28), but the Gospels of Mark (15:16-17) and John (19:2) indicate that the soldiers, mocking Jesus as a king, clothed him in purple. Interestingly, at least one commentary suggests that the robe was probably red when it was new, but had faded and become soiled so that it seemed to be purple. The wearing of red clothing by cardinals, according to some accounts, arose from a medieval custom in Lyons, France, where the canons of the cathedral wore red to distinguish themselves from other clergy. The office and title of canon is an honorary appointment by the diocesan bishop, usually conferred on older or retired priests today, but historically the canons were a diocesan bishop’s closest advisers and filled an important role. In time, probably in the late Middle Ages or very early Renaissance, the cardinals of the Church came to wear red, undoubtedly as a means to distinguish themselves from other clerics. A later, pious explanation led to today’s understanding that the cardinals wear scarlet red as an outward sign of their willingness to shed their blood in defense of the Catholic faith. The purple worn by bishops today is not a true purple, but rather a magenta color. During liturgical ceremonies a bishop or cardinal will wear the “choir” cassock, which is entirely purple or red; otherwise, the cassock worn is the “house” cassock, which is black with purple or red buttons and fascia, or sash. 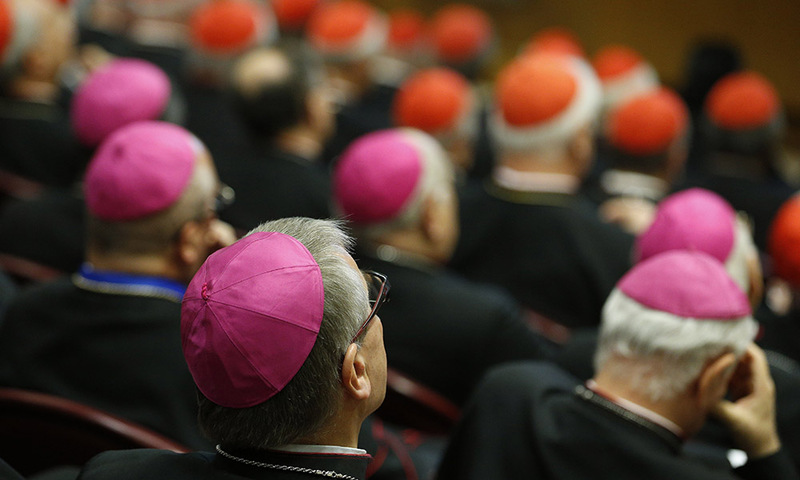 Is it incorrect to suggest that bishops wear purple in imitation of the sufferings of Jesus, or that cardinals wear red in witness of their willingness to die for the Faith? No, certainly not, but these pious explanations came centuries after the colors actually began to be worn by bishops and cardinals. Perhaps not the original reasons for selecting these colors, they are today the reasons these colors remain in use.